To write alternative history carries some likeness to writing fantasy, in that the world creation is a fundamental part of the writing endeavour. In difference to fantasy, writers of alternative history have to tread a very fine line between the invented and the impossible, i.e. 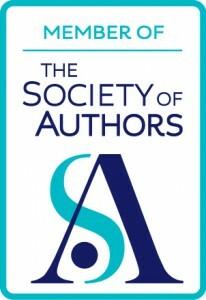 expectations are that the writer creates a society we, as readers firmly rooted in our reality, can conceive as being an alternative outcome had things been somewhat different. Authors like Robert Harris do this with panache. Writers like Stephen Fry do it with ironic humour. 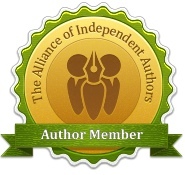 And writers like Alison Morton just do it, a few deft brushstrokes, no more, and Roma Nova is a feasible little European country in a world where Adolf Hitler never happened and where the northern parts of the American continent remain divided between former English, French and Spanish dominions. Roma Nova lies snuggled into the folds of the Alps. A last refuge for a group of Romans fleeing the devastation of the Germanic invasions, this is where Roman Senator Apulius and his family and followers settled, ready to make a last stand if needed. Our staunch Roman was married to a spirited Celtic woman who gave him four equally spirited daughters but no son. And so, through a combination of chance and expediency, Roma Nova developed into a matriarchial society, a country where the family heads always are female, but where traditions and concepts of duty towards the state remain rooted in Roman values. So well does Ms. Morton paint this little country of hers that I find myself considering just how to travel there – by car? By train? Until I remember that I can’t go to Roma Nova – not outside the pages of Ms. Morton’s novels. Fortunately, she has so far written four and is intent on writing a couple more. Now, as we all know, a setting does not a novel make. However intriguing Roma Nova is, however fascinating Ms. Morton’s descriptions are of Saturnalia celebrations, of funerals as per ancient Roman rites, it would be a thin soup indeed had Ms. Morton not also gifted us with Carina Mitela and her husband Conrad Mitelus. Carina Mitela became a friend of mine in Inceptio, the first of the series. Tough when so required, careful with whom she allows to penetrate the shield of reserve with which she manages her life and her emotions, she is a woman who believes in herself, believes even more in right and wrong, and who is dedicated enough to doing her duty that she will risk her own life if so required. Carina was not always Carina. Born in the E.U.S. (Eastern United States), she used to be Karen, a rather downtrodden and insecure Karen, until one day she was appraised of her family in Roma Nova and whisked back to her ancestral country by Conrad, her husband-to-be. When Perfiditas opens, Carina has lived in Roma Nova for seven years or so, successful in her military career, proud mother of three and happily married to Conrad. Her husband is as dedicated, as tough, as she is. He is also somewhat damaged due to a harsh childhood, and his reluctance to talk about his experiences leave him far more vulnerable than he realises – or at least wants to accept. Instead of a touchy-feely approach to these sensitive memories, Conrad has recreated himself from a hurting, wounded boy to an efficient and self-sufficient military leader, capable of much warmth and affection towards those he loves – as long as there is no conflict between his private life and what he perceives as his duty to Roma Nova. At times, these two people tear each other apart – and things are not exactly simplified by the fact that Conrad is Carina’s commanding officer. Sometimes, when Conrad makes a call he considers correct in his role as Praetorian Legate, he is at the same time figuratively back-handing his wife over the face – or so she feels. Are there consequences? Of course. Ms. Morton does a great job of describing the tension caused by Conrad repeatedly setting duty before Carina. Yes, sometimes Carina breaks every rule in the book – for all the right reasons – so maybe he’s entitled to some irritation, but there are times when this reader wants to take the stupid man by the shoulders and shake him until his teeth rattle, so stiff and insensitive does he seem. Besides, Conrad has problems handling the fact that at times it’s Carina saving him from dire death rather than the other way around. Especially when she uses her underworld network to do so…especially when it is rather apparent Carina is not entirely unaffected by the leader of this network. Which, just by chance, brings us to Apollodorus, the enigmatic man who has previously helped Carina out of a tight spot or two in a rather unorthodox manner. Apollodorus is a man of night and shadow, instinctively disliked by Conrad, discreetly admired by Carina – after all, she more or less owes the man her life. Cultivated, smooth and possessed of eyes as dark as pools of pitch, Apollodorus has only ever loved one woman – Carina. No wonder Conrad raises his hackles whenever Apollodorus is around. It irritates Carina that Conrad will not extend the benefit of the doubt to Apollodorus. It makes Conrad see that his wife does not steer clear of this dangerous, amoral man, a man as subtle as a stalking leopard, ruthless and efficient, unfailingly polite and always in control. Apollodorus is a puppet-master, and just how intricately he weaves his various threads is revealed in bits and pieces, causing Perfiditas to twist and turn like a trapped snake. Other than the three protagonists, Ms. Morton has gifted us with a broad cast of characters it is easy to relate to, all the way from Carina’s impressive grandmother, the mater familias Aurelia, to former gladiatrix Mossia. With an economy of words, a few lines of description, no more, she brings her extensive cast to life, making each and every one of them distinctive. 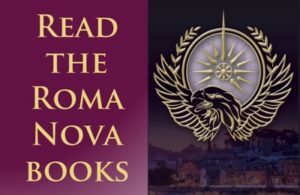 The plot is skillfully constructed: in this case Roma Nova is threatened by a band of determined coup-makers who want nothing more than to return Roma Nova to its true Roman roots, i.e. relegate women back to a position of invisibility, reduced to being wives and mothers, subservient to men. As a modern woman, I find the matriarchal society portrayed by Ms. Morton quite fascinating – even more so because fundamentally Roma Nova is an egalitarian society – men and women are true equals in all aspects of life. The wannabe coup-makers don’t agree: they are sick of the rule of women and set out to throw off this terrible yoke of oppression. Nothing is ever as simple as it seems, and as Carina digs deeper into a plot that not only threatens her country but also her loved ones, she uncovers one layer after the other of rot. In defence of her own, Carina is formidable, holding herself together even during those periods when Conrad leaves her to do battle alone. But it costs her, and her vulnerability, her sensation of abandonment when Conrad retreats into professionalism rather than supporting her, his wife, is excellently depicted. To an exciting plot and well-developed characters, must be added the casual if precise descriptions, bringing to life everything from the holding cells of the Praetorian Guard Special Forces, to the streets and buildings of Roma Nova. In expressions, in off-hand depictions of traditions and rituals, Ms. Morton’s passion for things truly Roman shines through. Ms. Morton has done her research, and so heavy togas are discarded casually, studded sandals clip over tiled floors, young girls are proud of their new pallas, the atriums are adorned by the statues of the ancestors – all of this without ever becoming contrived. Ms. Morton takes her readers for quite the ride in this book, and passages of introspection vie for space with fast-paced action scenes that have this reader holding her breath – or chewing her nails. While Ms. Morton writes strong and fluid prose, it is her dialogue that blows me away. Pitch-perfect, distinctive and vivid, it brings Carina and all the rest to vibrant life, offering insight into the various character’s thoughts without ever sacrificing rhythm and pace. 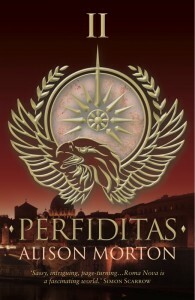 In conclusion, Perfiditas is a great read, a book that has you saying, “Hmm?” without raising your eyes from the page should anyone attempt to talk to you while immersed. Here and there, I spot a missing quotation mark, but such minor beauty spots are, in this case, more like freckles – distracting, but also cute. Unfortunately for me, I have already read all Ms. Morton’s books. I crave another – soon! So, Ms. Morton, to paraphrase a famous Latin quote: Scribere necesse est, vivere non est necesse or in other words, please get on with it and write the next one! Gosh, this is a review and a half. Anna Belfrage has certainly not missed any facet of the fascinating Roma Nova series. It’s an excellent review. Very well done, Alison. Thrilled to my socks with this one!